A prospective cross-sectional case series study. To investigate the prevalence of low virulence disc infection and its associations with characteristics of patients or discs in the cervical spine. Low virulence bacterial infections could be a possible cause of intervertebral disc degeneration and/or back pain. Controversies are continuing over whether these bacteria, predominantly Propionibacterium acnes (P. acnes), represent infection or contamination. However, the current studies mainly focus on the lumbar spine, with very limited data on the cervical spine. Thirty-two patients (20 men and 12 women) who underwent anterior cervical fusion for degenerative cervical spondylosis or traumatic cervical cord injury were enrolled. Radiological assessments included X-ray, CT, and MRI of the cervical spine. 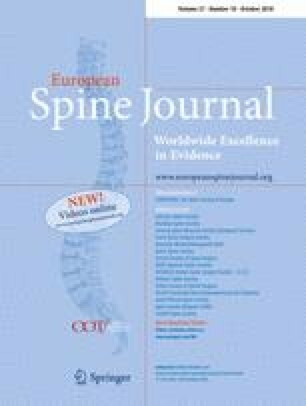 Endplate Modic changes, intervertebral range of motion, and disc herniation type were evaluated. Disc and muscle tissues were collected under strict sterile conditions. Samples were enriched in tryptone soy broth and subcultured under anaerobic conditions, followed by identification of the resulting colonies by the PCR method. Sixty-six intervertebral discs were excised from thirty-two patients. Positive disc cultures were noted in eight patients (25%) and in nine discs (13.6%). The muscle biopsy (control) cultures were negative in 28 patients and positive in 4 patients (12.5%); three of whom had a negative disc culture. Seven discs (10.6%) were positive for coagulase-negative Staphylococci (CNS) and two discs were positive for P. acnes (3.0%). A younger patient age and the extrusion or sequestration type of disc herniation, which represented a complete annulus fibrous failure, were associated with positive disc culture. Our data show that CNS is more prevalent than P. acnes in degenerative cervical discs. The infection route in cervical discs may be predominantly through an annulus fissure. Correlation between these infections and clinical symptoms is uncertain; therefore, their clinical significance needs to be investigated in the future. Yilei Chen, Xianjun Wang, and Xuyang Zhang have equally contributed to this work and should be regarded as the co-first authors. The online version of this article ( https://doi.org/10.1007/s00586-018-5582-4) contains supplementary material, which is available to authorized users. The authors would like to acknowledge Prof. Michael Adams for the assistance in revising this manuscript. Medical and health research project of Zhejiang Province (2015KYB448). Written informed consent was obtained from all participants in the study.